I love ivy. I always have. Something about the way its tendrils wind and curve around anything they touch. There is something loving about that 'reaching out' and 'embracing' in its nature, something about its foraging and striving to expand that seduces me. And ivy leaves are so elegant and beautiful - especially the variegated types. 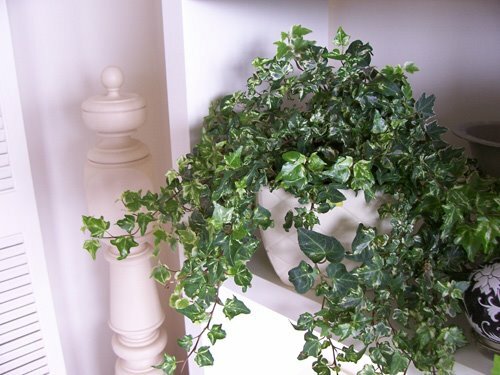 Ivy indoors was adored by the Victorians, who popularized it as a houseplant. It's been portrayed in art and used in numerous decorative ways, inside and outside. As a foliage plant, it is one of the most popular and beautiful. 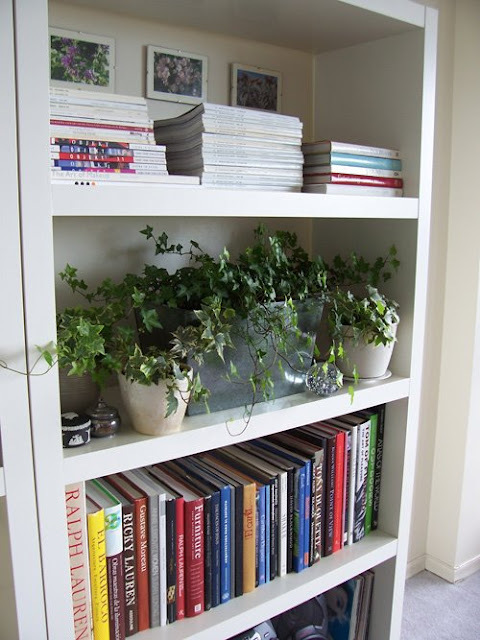 Pots of ivy are often hung from the ceiling so that their tendrils dangle down, but I prefer them grounded on shelves. 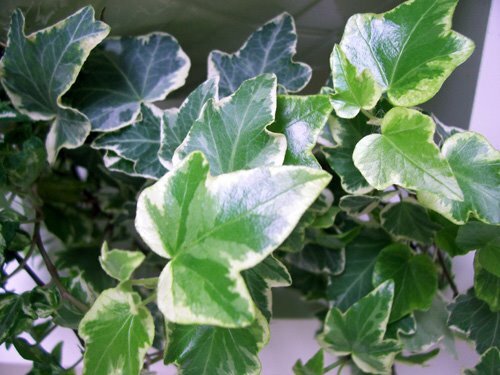 I grow standard versions of ivy (hedera helix) and variegated 'Gold Child' hedera helix. I mix them up in pots and planters and mass them together on one shelf to create a cascading effect. The texture looks wonderful. I also intersperse the planters with ornaments, like black Wedgwood jasperware, antique silver containters and decorative orbs. Ivy does best in bright, indirect light. The plants do not like full sun and can tolerate low light. The key is keeping the soil consistently and evenly moist. They can stand a misting now and then, too. They like the room temperature to be on the cooler side of the spectrum, so keep them away from heaters in the winter. Placing them on shelves, or suspended from the ceiling, is ideal. 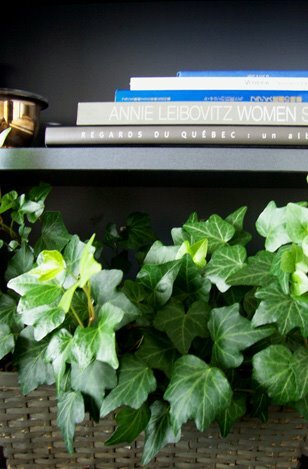 A mass planting of ivy on one of the shelves in the living room. 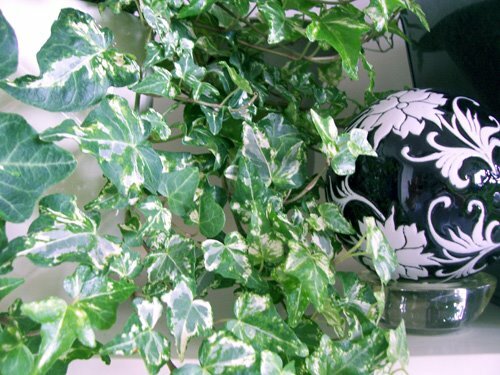 A black and white decorative orb with tendril designs is tucked in among the foliage. 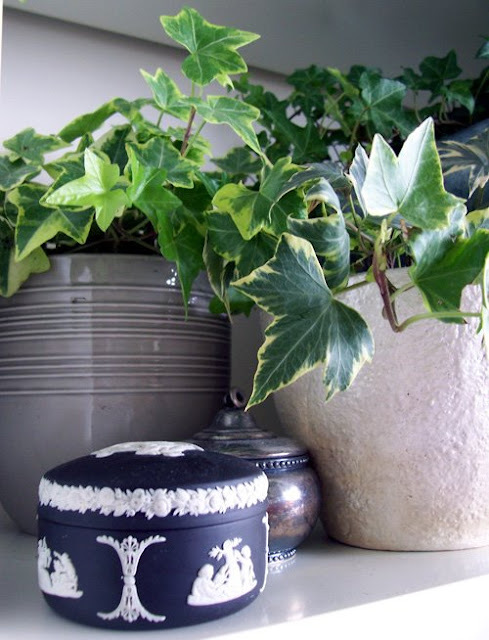 Black Wedgwood jasperware and an antique silver container make a little vignette next to larger planted pots. The plant pot on the right is one that I made in ceramics class and finished in a 'mother of pearl' glaze, which gives it some shimmer. This is my favourite ivy plant. It's the "Gold Child' variegated type. It's healthy and large and grows exactly as I want it to. The ballister in the corner of the room, by the way, is from my grandfather's first home. It was saved before the house was torn down in the '60s. It has been preserved and passed down, generationally. I painted it in a soft cream tone. I also grow ivy in my bedroom. I purchased a plain wicker basket at Michael's and painted it a dark charcoal, to match the shelves, lined it with plastic and planted the ivy in it. Andrew, that is one fabulous bookcase! :) I love the variety of vertically as well as horizontally shelved books and magazines, and the arrangement of framed photos hanging on the back of the top shelf. And that piece of Jasperware is beautiful! Very inspiring. Thanks, Kevin! I (heart) Ikea. It's so affordable; it's clean; it's modern; it's easy in every way. And it's just great design. And I try to soften those hard edges with things I love. I'll have more apartment photos in the coming weeks. I love your ivy and the bookcase vignettes are so very elegant! Thanks for the kind words, Elaine! We have a small apartment, but we make the most of it.